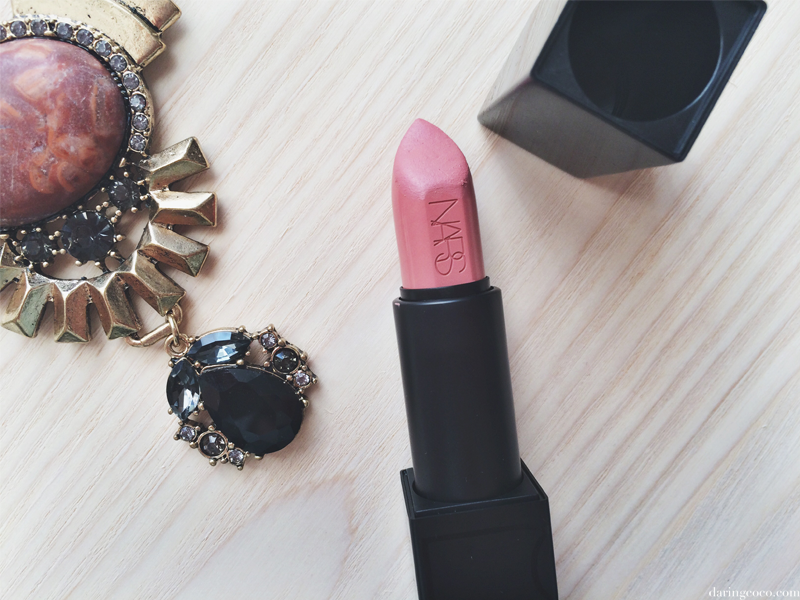 When it comes to lipsticks, I’ve been loving anything in a satin finish lately. And it’s no surprise that this love would also extend towards my beloved NARS. And I can earnestly say that the NARS Audacious range contains the best satin lipsticks you’ll encounter. And I’m aware you may think I’m blatantly bias here given my overall obsession with this beauty brand, but a quick search on the internet and you’ll find nothing but raving reviews from people of all walks of life. Personally I’ve acquired around six different shades from both the matte and satin formulations. From classic reds like Annabella to the ultimate vamp Liv. When it comes to neutrals NARS Audacious Lipstick in Raquel has been my one and only; despite being known to favour Anita here and there. However this is always a quick fling. 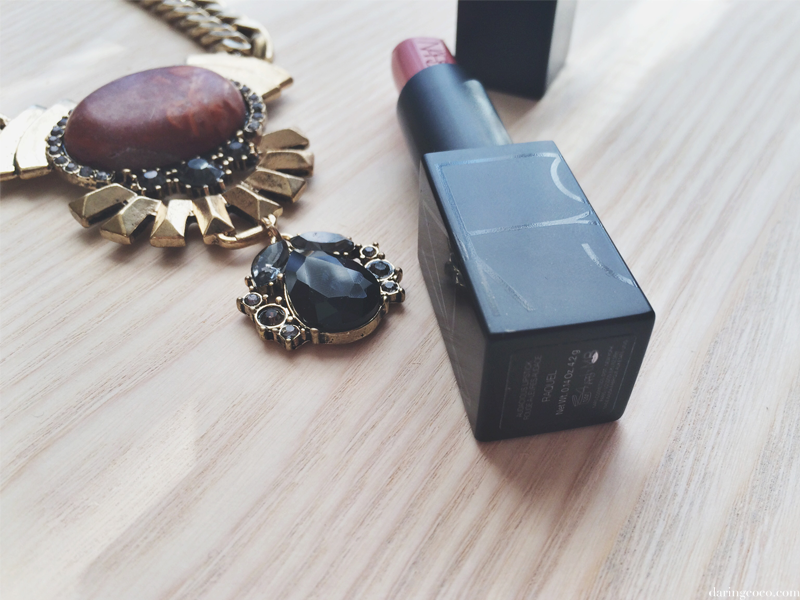 Soon enough I find myself running back to my revered NARS Audacious Lipstick in Raquel. Because of a few drug store bad eggs matte and satin lipsticks tend to have the incorrect fallacy that these types of lipstick have the vexatious tendency to dry out ones lips or to be not-so-lasting. Honestly I’ve found the Audacious line to be continually consistent in terms of pigmentation and hydration. Have you tried a shade from this range yet? Did you draw the same conclusions as I did? Because I’m yet to encounter a shade that dries or burrows into those ghastly crevices on my lips. And in terms of wear, I’ve been pleasantly content with their staying power. Especially considering application; one swipe is all you need. Even when consuming food or drink, it doesn’t become obvious nor blotchy but another lick of lipstick doesn’t hurt either. 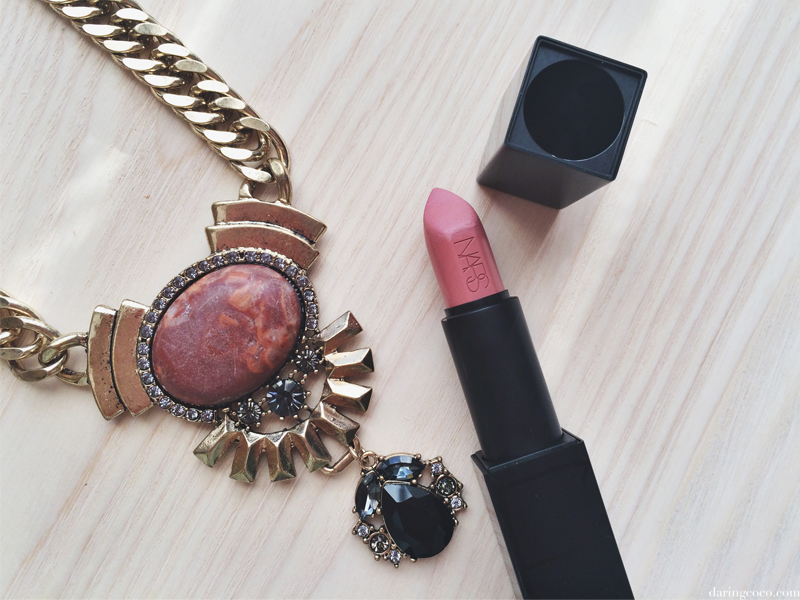 The NARS Audacious Lipstick in Raquel is a satin finish and has a soft, peachy rose tint. Perfect for any complexion really. I’ve worn this shade both when I’ve been deathly pale during the winter months to glowingly fake tanned during the summer. On my complexion I found that during my paler moments my skin tends to bring out the rose tones more. And when I’m slathered in a chic shade of brown, the peachy orange hues are nicely prevalent. It’s an ideal shade for both casual or dressier needs. The colour is subtle so it makes it perfect for when you don’t want to leave the house bare lipped, but don’t want to look overly done up. Au naturel. It’s also exceptional paired with a sultry, rock ‘n’ roll smokey eye. In regards to the packaging, I’d spend my money for this alone. A minimal matte black case with a fine but glossy wrap around logo on the base. It’s as beautifully sleek as the contents it protects. There’s also a magnetic closure that snaps both parts into their corresponding position. Aside from being quite entertaining, this is ideal for the usual wear and tear of life and travel because you need not fear silly accidental wastage disasters when the lids of lipsticks become dislodged. Cost wise they tend to be more on the pricey side but it’s well worth it in my opinion. Like they say, you get what you pay for and this line my friends, is well worth parting your cash with because it’s generously exceptional for the price.